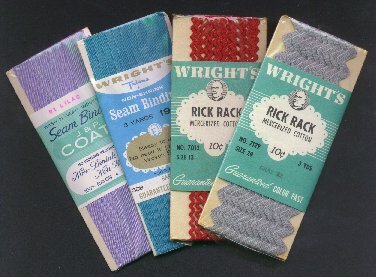 "Wright's Vintage Rick Rack and Seam Binding - 4 unopened packages." (1294) Wright's Vintage Rick Rack and Seam Binding - 4 unopened packages. - Condition: Very Good - Wonderful vintage Rick Rack in sealed packages. There are two packs of Mercerized Cotton Rick Rack and two packs non shrink seam binding. Price: $4.00 + shipping.